Hi, everyone! I’m Jessica Walters, and I’m a trainer here at Old Town Athletic Campus. I have been a personal trainer for about 5 years now. 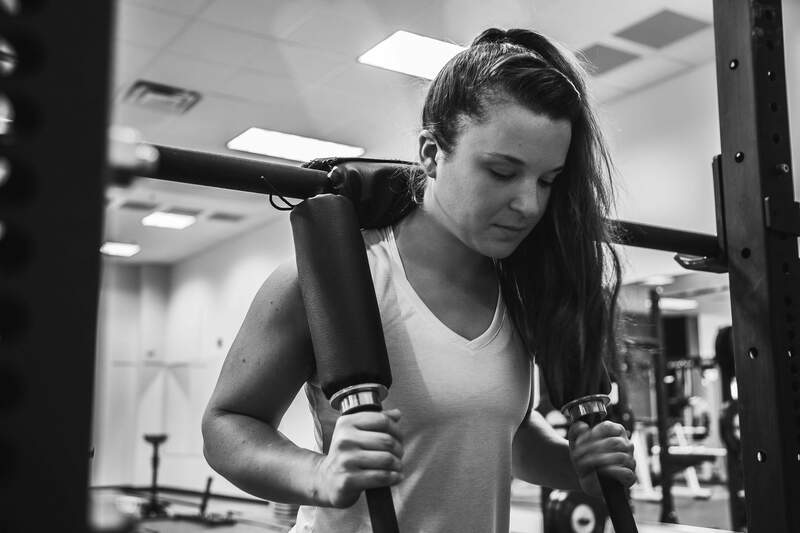 Over the years, a concern I’ve heard over and over again from women in the gym is “bulking up” from lifting weights. Oftentimes, they reference women who are professional bodybuilders, but the truth of the matter is those women look that way on purpose. For a professional bodybuilder to achieve the optimal figure, she must consume a much larger-than-average amount of calories/protein AND commit many hours a day to working out. The hard truth is that sometimes those women are actually supplementing with steroids, which isn’t legal or healthy. Each calorie, supplement and workout is carefully calculated in order to achieve that body type. And let’s face it–most of us only can commit about 3 hours a week to exercise, we are not consuming thousands of calories a day, and the simple matter of fact is that we, as women, do not produce enough testosterone naturally to ever reach a “bulky, manly” physique! If you’re a woman who has stayed away from the “boys’” part of the gym and skip the weights, you are truly missing out on being in the best shape of your life! I feel it is one of my responsibilities to help women fight this myth and make weights part of our domain, too. And I can tell you from personal experience. When I was 18, I wanted to get into shape and lose weight after retiring from softball. I thought the only way to do this was to run. I’d spend hours and hours a week running. I became exhausted, my joints ached, I felt weak, and on top of that, I looked unhealthy. I mean, I was only 18 and I already had joint pain! I knew deep down this wasn’t right, so I started to study a different realm of fitness: weightlifting. And since then, I have not looked back. When I learned how to lift weights correctly, my body completely changed. I felt stronger, happier, and had way more energy. In fact, lifting weights helped my running improve as well. AND I didn’t have to spend hours in the gym! The moral of the story is, don’t ever let the fear of “bulking up” discourage you from lifting weights. Here’s what you’re really doing when you lift weights: tightening, toning, preventing bone deterioration, reducing joint pain, improving your sleep, burning more calories and increasing your energy! And if you don’t know where to start, COME SEE ME!